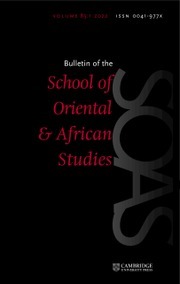 The Bulletin of the School of Oriental and African Studies is the leading interdisciplinary journal on Asia, Africa and the Near and Middle East. It carries unparalleled coverage of the languages, cultures and civilisations of these regions from ancient times to the twentieth century. Publishing articles of the highest academic standard, it also features an extensive and influential reviews section. Noel Q. King (trans.) and Albion M. Butters (ed. ): The Travels of Ibn Battuta to India, the Spice Islands and China. Princeton, NJ: Markus Wiener Publishers, 215 pp. 2018. ISBN 978 155876634 1. Barend J. Ter Haar: Guan Yu: The Religious Afterlife of a Failed Hero. ix, 285 pp. Oxford: Oxford University Press, 2017. ISBN 978 0 19 880364 5. Elizabeth R. Alexandrin: Walāyah in the Fāṭimid Ismāʿīlī Tradition. x, 366 pp. Albany, NY: State University of New York Press, 2017. ISBN 978 1438 46627 9.